I’m not sure how or when, but somewhere along the way I think Brussels sprouts actually became my favourite vegetable. Like…how did that happen? Maybe it’s because they’re a wonderfully seasonal vegetable that remind me of cold fall/winter days and and cozy holiday meals. Or maybe I just figured out how to cook them in a more appetising way. 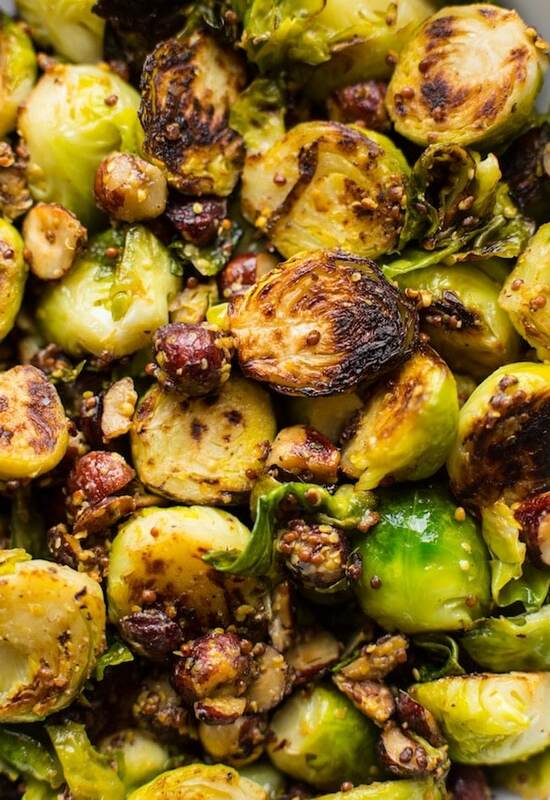 I mean…just look at that beautiful charing ↓ ↓ ↓ ↓ Whatever the reason I’m just gonna go ahead and lean into the sprouts love because this is one side that’s too delicious not to make! 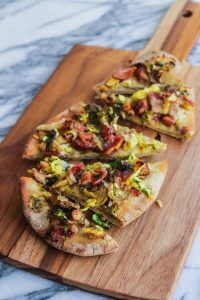 This recipe is super easy to make and made with only eight ingredients in one pan – and two of those ingredients are salt and pepper so really it’s more like six ingredients. First thing up: make a garlic infused olive oil. You get faint hints of garlic without being too overpowering. In a large skillet/pan warm your oil. When it’s nice and hot add the garlic and sauté for a couple of minutes until the garlic starts to turn golden. Once the colour changes just remove it from your pan. From that point you can add your sprouts and sauté in your newly made garlic infused oil. 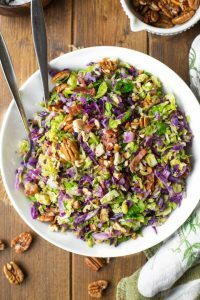 Toss around in oil for a minute or two before covering with a lid and letting the sprouts cook undisturbed for about 10 minutes. In this time they’ll begin to soften and charr slightly. 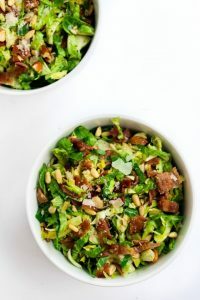 Once the time is up, uncover the pan and add in your chopped hazelnuts for some added crunch and mix in your mustard combo for some added tang and punch. At this point there’s nothing left to do other than season with a little salt and pepper as you see fit and that’s it! 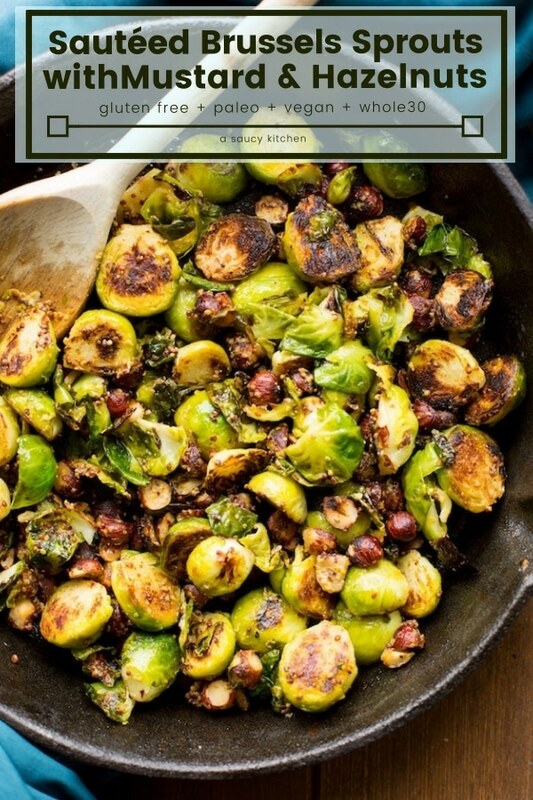 These sprouts would make a great addition to your Thanksgiving or Christmas dinner menu. Holiday or not they’re a fantastic side to have day of the week! 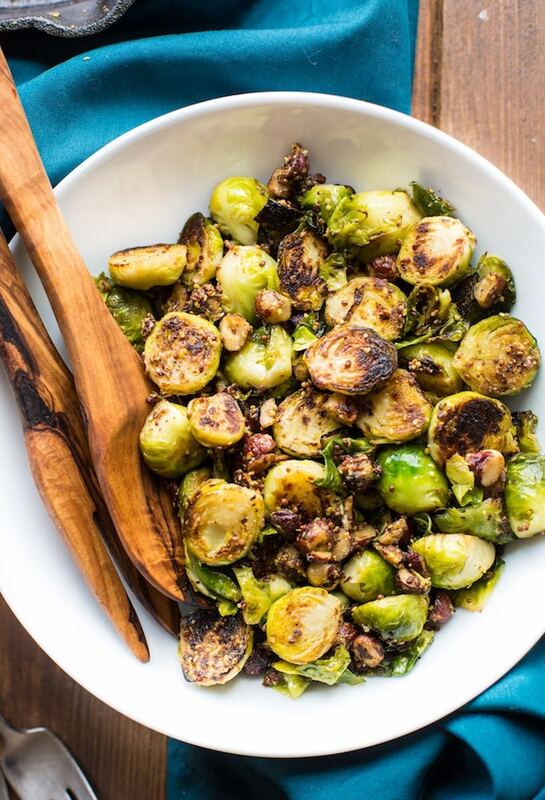 Don’t forget to tag @asaucykitchen if you try these Sautéed Brussels Sprouts! You can also post your pictures to my facebook page! In a large skillet/frying pan, warm the olive oil on a medium heat. Add the smashed garlic cloves to the oil, sauté and cook for 5 minutes, or until the garlic turns golden. 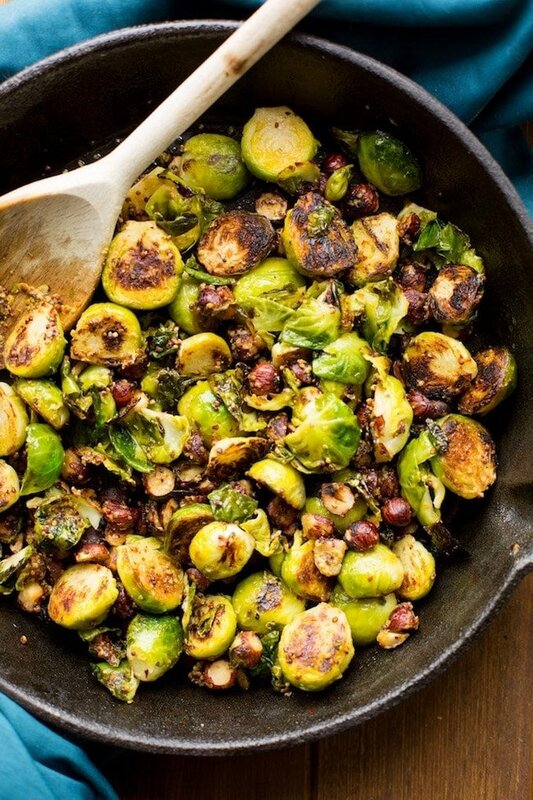 Remove the garlic from the oil and add the prepared brussels sprouts. Sauté for about 2 minutes, stirring the sprouts in the oil. Once stirred, cover and cook for 10-15 minutes. Uncover and add the chopped hazelnuts + both mustards. Mix them in to coat the ingredients. Season with salt and pepper, taste, then add more as needed.